Our Rural Kent Cottages are the ideal base for your holiday. Immerse yourself in the Garden of England with its hop gardens, vineyards, castles and of course it's rolling countryside. Kent is a truly beautiful place to book a holiday at any time of the year. Below you can find the latest availability of properties in this stunning county. There are plenty of places to visit during your holiday. There is an abundance of open gardens and heritage sites in Kent offering a glimpse into life in the South East. You can also enjoy a real taste of Kent as you will be spoilt for choice with numerous pubs and restaurants serving fresh seasonal dishes created with locally sourced produce. Pick from a range of attractions that will keep everyone busy. All ages will appreciate the castles and gardens which are so popular with all visitors, not to mention the many other heritage sites and museums in the area. 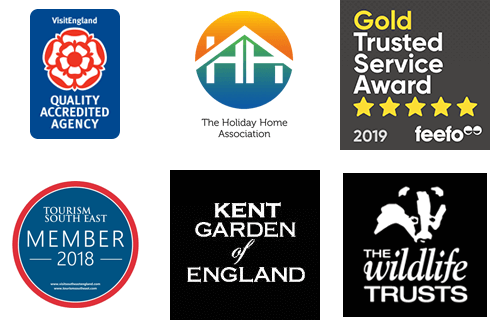 Our extensive portfolio of self catering properties offers a range of holiday accommodation throughout the Kent countryside. From traditional Oast Houses and Kent country cottages, to a charming selection of contemporary conversions and properties to suit all tastes. We just love our period properties in Kent, but our modern holiday accommodation is just as good. We also offer pet friendly accommodation for those wanting to bring their dog along on their trip to Kent. Use our guide on holidaying in Kent to start planning your getaway. A charming studio apartment in walking distance of the lovely tree lined High Street of Tenterden with fine shops and restaurants. From the garden there are glorious sweeping views over unspoilt Kent countryside and the steam railway. A pretty beamed and vaulted cottage for two with scented roses around the door. Located on a working farm but within walking distance to St Michaels and Tenterden with great restaurants and local vineyards to explore. Little Gem is minutes from the centre of Royal Tunbridge Wells - in a quiet residential area - offering top quality accommodation for two. Immaculate holiday cottage set within the grounds of the owners stunning farmhouse on the outskirts of Biddenden village. Sissinghurst Castle and Gardens are just up the road.